Courtesy of Phyllis Browning Company, Jill Christian. Foundation work with lifetime transferable warranty to be completed April 2019. One story garden home in Windcrest. Home is close to neighborhood park – tennis courts and playscape. 3 bedrooms and 2 bathrooms, a large great room with vaulted ceilings, beams, fireplace and built-ins, private patio/courtyard. Rear entry 2 car garage with extra storage areas. Large kitchen and breakfast area with a built-in desk.Formal dining, 4 sided brick, sink in laundry room.Lots of potential.Close to RAFB and Ft. Sam. Please, send me more information on this property: MLS# 1363611 – $215,000 – 5809 Winding Ridge Dr, Windcrest, TX 78239. 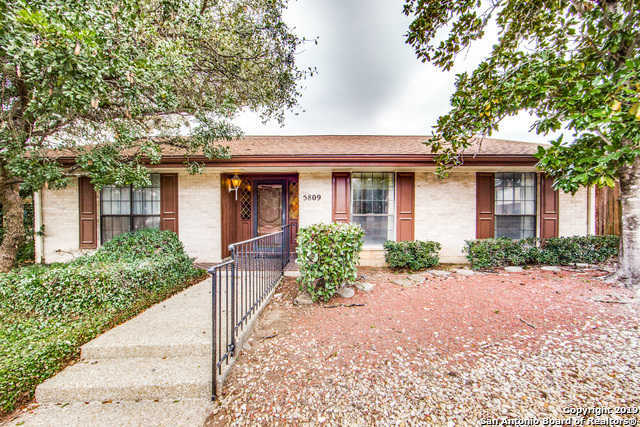 I would like to schedule a private showing for this property: MLS# 1363611 – $215,000 – 5809 Winding Ridge Dr, Windcrest, TX 78239.